Usually a retailer uses different solutions for the different parts of his process. Let's take the example of a retailer using one solution to the POS management, another one for the global company strategy monitoring and a third one for the accounting. The main problematic is then how to send the information from one solution to another one without loosing any data, keeping the information integrity and maybe arrange it to fit the receiving solution format. ibs Integration gives an administrator the possibility to manage the data flow from a point to another one in guaranteeing the information integrity. ibs Integration mainly permits an administrator to manage the data flow from any solution to Soft Solutions' Suite and the opposite. Thanks to ibs Integration, the administrator monitors his interface, choosing when importing and when exporting data and the level of automation. Indeed, as ibs Integration is being part of Soft Solutions' Suite, it can benefit from the Workflow application to automate the integration process or include integration within a whole business process. ibs Integration is also capable of managing massive data integration from CSV file to the Suite. It permits users to make their process more productive, whenever they need to key in lots of information from a listing into Soft Solutions' Suite, such as the contract conditions, handled by ibs Deals. In this case, the users can either work in the application to key in the conditions, or configure a mapping in ibs Integration to import the data from a CSV file. The import will be then controlled at the data integrity level, before updating the Condition section. 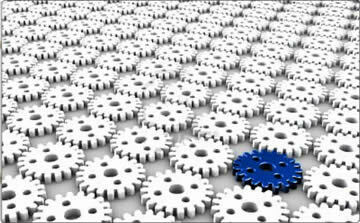 The integration process can be either launched manually or launched automatically thanks to a workflow. 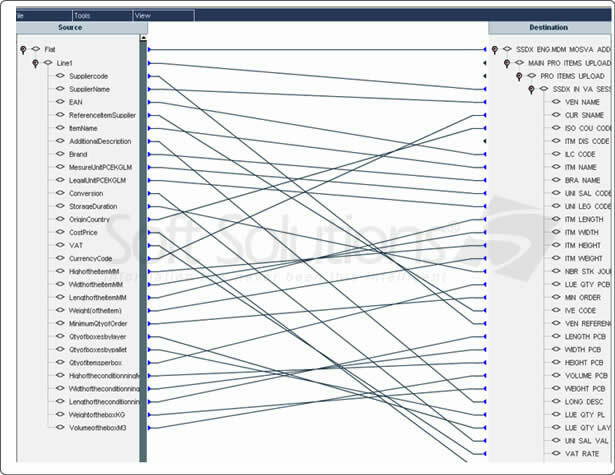 The mapping design tool in ibs Integration permits to map the fields between the source file and the destination file. This tool provides also some functions to arrange the data whenever the source and destination fields have not the same format. 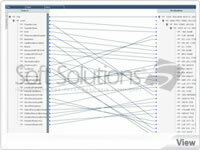 ibs Integration is a Solution to manage Soft Solutions' Suite interfaces, with other solutions or to/from files. As it is fully embedded to Soft Solutions' Suite, it can handle any data from the Suite and benefits from the other RES tools.